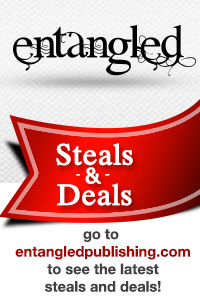 Home » Entangled News » Sign up for Steals & Deals! Everyone loves a great deal, right? What if you could have amazing deals, and get a steal of a price (sometimes even free!) on riveting books every single week? Entangled’s Steals & Deals offers you just that opportunity. We offer new release books On Sale, or at the introductory price of just 99¢, and every once in a while, we throw in a free book or novella to keep things interesting. We believe in loyalty. We’re a small, grassroots company. We started with a vision of offering the best books to readers, all the while doing right by our authors by offering them the best royalty structure possible. So many authors and readers took a chance on us when we were brand new. Now, 3 years and multiple USA TODAY and NY Times bestsellers later, this is one way we’re able to give back to you, the reader. We value you. We know you have myriad reading choices out there. You’re discerning and we want to be the publisher you turn to first for the best books at the best prices. Offering you the chance to try some of our books at great introductory prices give us the chance to show you the quality of our books, and gives you the chance to read to your heart’s content—without breaking your bank. You don’t have to choose! Get as many of these great deals as you want. Five books for the cost of a designer coffee. That’s pretty sweet…and books last longer! Sometimes it’s hard to know what book to read next. We sometimes offer the first book in a series at the On Sale price of 99¢, and sometimes it’s free, so you can discover something new. If you haven’t already, sign up for our Steals & Deals newsletter and be first to hear about the amazing books and even more amazing prices. Fill your eReader today!